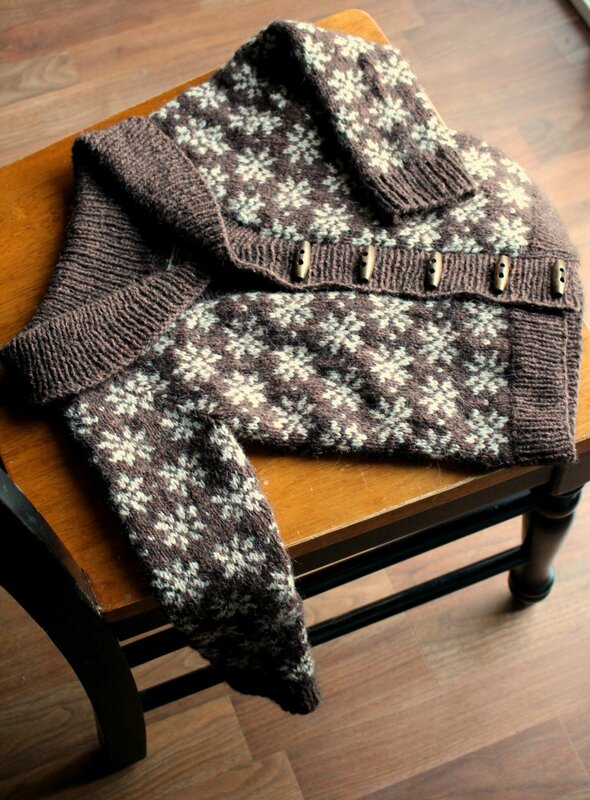 What do you do when you fear that the sweater you are knitting is turning out too small? 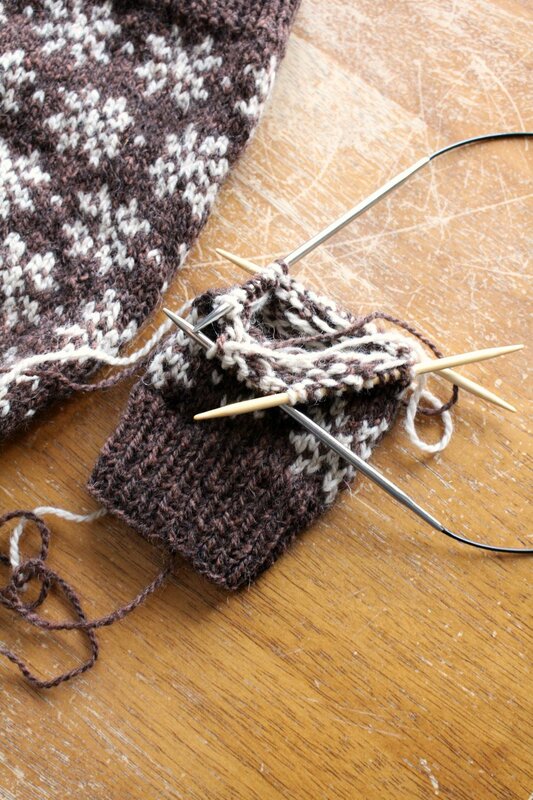 Knit faster, of course.. and make repeated stops to stretch out your fabric as you go. By doing this you may convince yourself that all will be ok... even though you KNOW in your heart of hearts that it really is not. 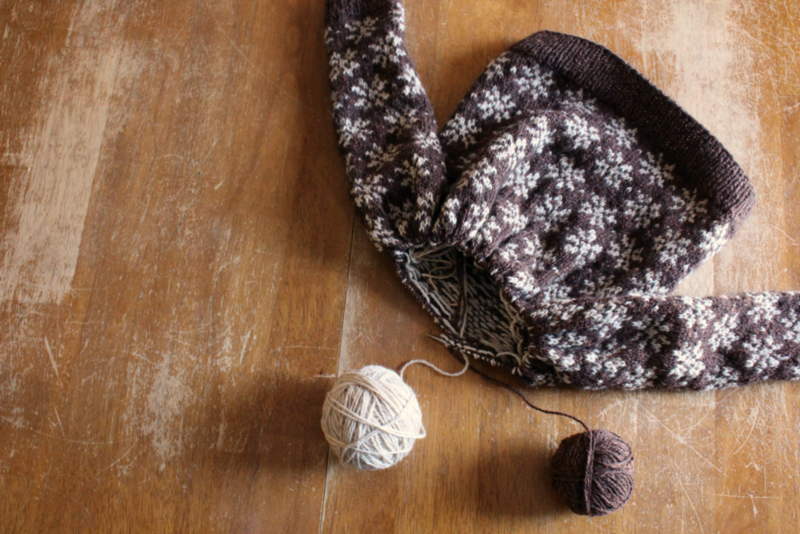 Early in the Summer I had such an experience as I started a special sweater for my daughter. As you may already know, she had a difficult year with her health and multiple heart surgeries, so I felt strongly about making her as many things as I could. Immediately the Saffran Cardigan pattern caught my eye. I had always intended to knit a stranded colorwork sweater for her but never had and this one was perfect in every way! All was well until I... cast on. I was simply too impatient at the time to do a gauge swatch in the round and in the colorwork pattern as the instructions called for. So I casted on with the recommended needle size and hoped for the best. About 4" in with significant stretching on my part after every row, I finally came to the realization that things weren't going to plan. I slipped the stitches onto scrap yarn and slid it over my daughters head to confirm my suspicion... It was skin tight. Not exactly the look either of us were hoping for in wool snowflake sweater. It was at this point that I should have ripped out and started over. And I almost did until I didn't. I will do anything to avoid ripping out my work. Good thing I have another smaller child in my life. The sweater quickly found a new intended recipient. So now, I had the task of knitting the stitches of a larger sweater size knit at the wrong gauge but to the proportions of a much smaller sweater. So I was working in between two sizes on a pattern written in metric measurements using entirely new techniques. Have I mentioned how absolutely horrifying it is to knit a colorwork sleeve on dpns? Especially when you lose one and have to use a circular needle too? Then I tried the finished sleeves on my crying, squirming 5 year old son to check the length. 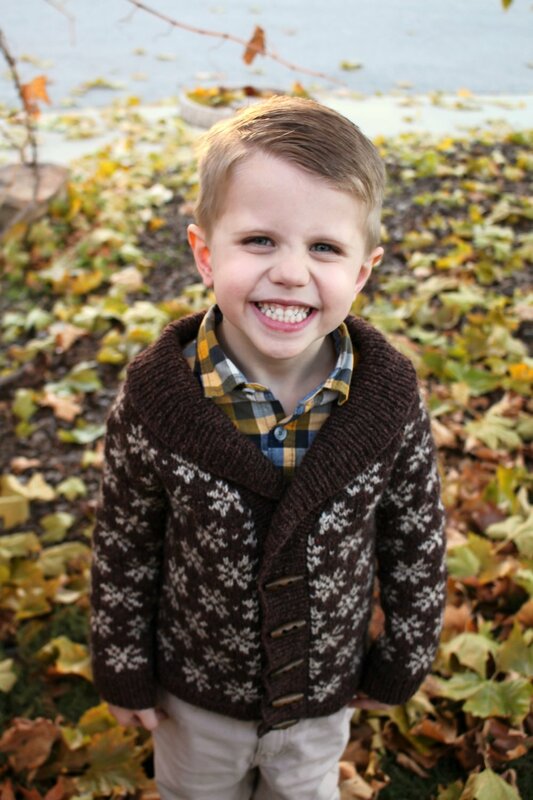 He informed me that the sweater was itchy and that he will never ever wear this sweater.. to which I replied... " YOU WILL WEAR THIS SNOWFLAKE SWEATER AND YOU WILL LOVE EVERY SECOND OF IT, SO HELP ME GOD"
Then I joined the sleeves to the body. Then I followed the directions for my first steek, mercilessly sewing then cutting my sweater completely in half. I posted videos of the process HERE and HERE that you can watch if you feel like dying a little inside. And just to make this project even more complicated for myself, I changed up the collar and added a shawl collar with short rows for a more boyish look. I also added an extra wide buttonband because yes.. the sweater was even a little tight on him! Then toggle buttons to finish it off! It needs one more toggle button added at the top.. but I think it turned out really cute. Pattern found HERE. Yarn found HERE.